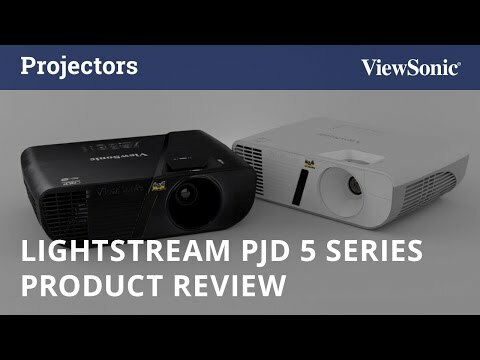 The ViewSonic LightStream PJD5155 projector features 3300 lumens, native SVGA 800 x 600 resolution, and intuitive, user-friendly design. Exclusive SuperColor™ technology offers a wider color range for true-to-life image projection, while SonicExpert™ technology delivers improved sound quality. The PJD5155 also features extensive connectivity including HDMI, 2 x VGA, Composite Video, S-Video, 1 x VGA output, Audio in/out, Mini USB and RS232. An energy-saving DynamicEco® feature reduces power consumption by up to 70%, and extends the lamp life by up to 10,000 hours. With advanced audiovisual features, and flexible connectivity options, the PJD5155 is ideal for use in education and small business environments. Packed with 3,300 lumens and a high contrast ratio (22,000:1 in DynamicEco® mode), this projector is guaranteed to produce bright images in any environment – even in rooms with high ambient light. Equipped with the latest HDMI, this projector can display 3D images directly from 3D Blu-ray® players—perfect for connecting to any HDMI-enabled devices such as PCs, laptops, tablets, and media players. A choice of 5 unique view settings provide the best possible viewing experience in any environment regardless of ambient light. These settings include: Brightest: ensures crisp, clear images in environments with high ambient light. Dynamic: best for delivering presentations or text-heavy content. Standard: ideal for projecting content from PCs and notebooks. ViewMatch: best for everyday general viewing. Movie: ideal for watching movies in darkened environments. Smarter design features include an intuitive and tactile keypad for simple operation, an easy-access top lamp door for simple lamp maintenance and replacement, and an optional cable management hood for reduced clutter. A programmable hotkey button can be configured to launch the most commonly used functions. In addition, users can control up to eight projectors in the same venue via a single remote control for easy projector selection and operation during lessons or meetings. With the DynamicEco® button on the included remote control, users can dim the projection brightness by 70%. DynamicEco® mode is also auto-activated whenever the projector is idle. When DynamicEco® mode is activated, the lamp’s power consumption is significantly reduced—a great energy-saving design that lowers the total cost of ownership (TCO). With the Smart Restart feature enabled, the projector can be quickly restarted from standby mode without waiting for a power cycle to complete. With the Quick Power Off feature enabled, the projector can be quickly powered off in seconds rather than waiting for a cool-down cycle to complete. This lets users pack the projector away without having to worry about the internal fan still running. All LightStream projectors automatically power on for quick and easy startup whenever a VGA or HDMI cable is connected. Conversely, when no signal is detected from a VGA or HDMI cable, the projector will automatically power off after a user-defined amount of time.